Air fryers promise crisp fried food without actual deep frying. Was it too good to be believed? And what can you cook in them besides French fries? In truth, air fryers cook food by blasting it with circulated hot air. The method is fast, convenient, and can be surprisingly good--if you have right recipe. 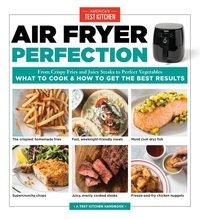 We cooked more than 70 pounds of potatoes to create the perfect air fryer French fry, with an evenly crisp exterior and creamy center. But what really drew us to this appliance was the variety of what you can make in it, effortlessly and without having to enlist numerous pots and pans. In addition to crispy fried chicken and fries, you'll turn out evenly cooked steaks, such as Chipotle-Coffee Rubbed Steaks with Snap Pea Salad (the spice rub gives them a bold crust), Sweet and Smoky Pork Tenderloin with Roasted Butternut Squash (the pork cooks directly on top of the squash to save time), and Tandoori Chicken Thighs. Many of the recipes yield both a main and a side for a complete meal. Most recipes take only 45 minutes or even less time, and all come with complete nutrition information. Frozen foods cook up crisp in the air fryer, but the results are so much better when you start with homemade. So we offer freeze-it-yourself Chicken Nuggets, Beef Hand Pies, and more that go straight from freezer to air fryer and cook to perfection. And we share plenty of kid-friendly meals and snacks, from Better Than Boxed Fish Sticks to Zucchini Fries.